Customers don’t come into a restroom expecting anything beyond standard amenities. That’s why it captures their attention when they do find something extra, like our state-of-the-art, tamper-proof mouthwash dispensers. Whether finishing a flavorful meal or a vigorous workout, clients will appreciate this premium amenity, also perfect for office settings. 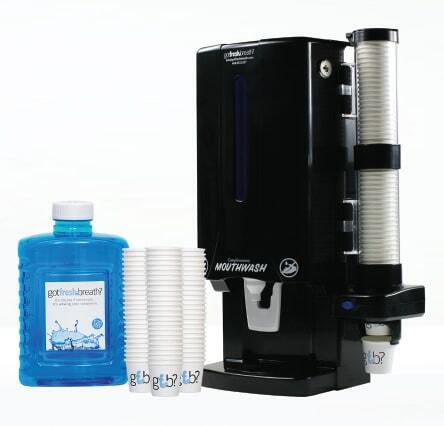 Your dispenser will be professionally installed and monitored during weekly Loyal visits, so that refills and maintenance never end up on your to-do list. Discover why businesses like Chick-fil-A, Anytime Fitness and Four Seasons rely on GotFreshBreathⓇ mouthwash dispensers!